Our Pescadero Palace Penthouse sits on a pristine 3-mile white sand beach, in front of one of the best surf breaks in Baja California! Excellent location 10 minutes to Todos Santos, and 40 minutes to downtown Cabo San Lucas. Amenities include a heated swimming pool, Jacuzzi, natural rock waterfall, free upgraded wifi, spectacular ocean views of the surf, full kitchen with all appliances and utensils, private washer and dryer, private gated entrance, and a walled compound for your privacy and security. We have enjoyed Roberts place again! If you are looking for a layed back vacation on the water, this is the place! Robert is a great host and we are never disappointed. Going to sleep each night to the sound of the surf and beautiful sunsets off our private deck is perfection. A nice pool and hot tub add to the relaxation. Always grateful for our time at Pescadero Palace! Beautiful view and setting. Excellent location close enough to Cabo and La Paz without all the chaos! Very relaxed and laid back area. Watching the surfers and whales was awesome. Robert is an excellent host. A truly exceptional Guest House on the beach! Every year (for over 10 years now), my mom has come for a 2-week visit to El Pescadero. She always stays here! The Paradise Penthouse has become her second home. This guest house is a perfect choice. Besides all the amazing amenities (pool, jacuzzi, A/C, TV, full kitchen), the view is absolutely spectacular from the private balcony and private sundeck . At night, the sound of ocean waves lulls you to sleep. 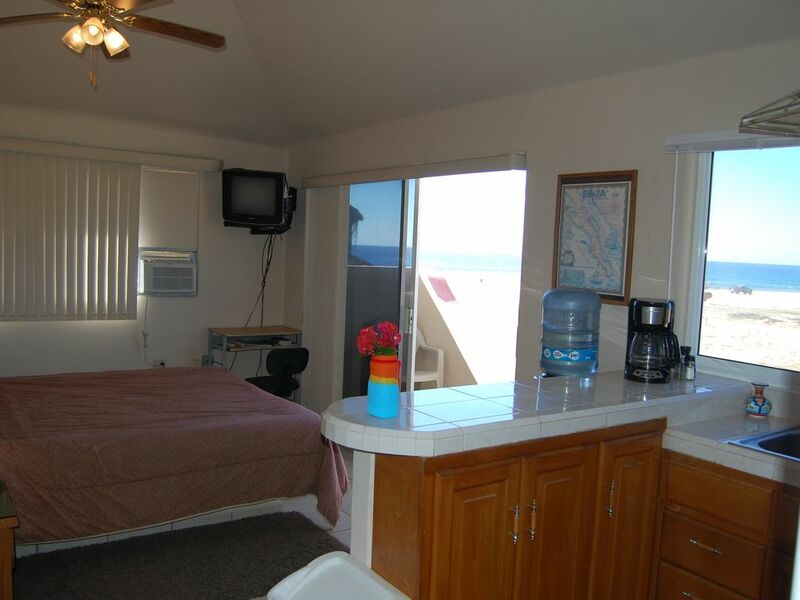 The rooms are clean and bright, the pool and jacuzzi well-maintained and pleasant. Only a one-minute walk brings you to a lovely beach that you will most likely have all to yourself. The owner makes a real effort to provide a stay as care-free and enjoyable as possible. Overall, this is the best place to be if you love private, well-located, tidy, peaceful places to spend your vacation. *Also, if you want more exciting options, the owner has an ultralight plane ready to give you the sky tour. Rob has a beautiful escape on the beach in Pescadero; a pool, jacuzzi, along with the apartments he rents out. We were also given excellent directions to the house and we had no problems seeing the road/sign posting. The apt. was roomy, had a full kitchen, and had more than enough of a view for us!! We loved being able to walk down to the beach for a swim, surf, or a walk during sunset. Rob even took us for a quick flight over the local area in his SkyRides ultralight! The town of Todos Santos was a quick 15 mins. away and is full of great coffee at La Esquina or Baja Beans, good food at Many y Alma’s; the town was charming and has many side streets to wander down. I would have no hesitations in reccomending Pescadero Palace to anyone interested in going to Baja. Thanks Rob for the great time! !